The 2013 1959 Les Paul Reissue celebrates the Les Paul Reissue tradition with flare. Gibson has gone back to the drawing board to create the most accurate ’59 Les Paul to date. Every detail is as close to spot-on as possible, down to the hand-carved maple top and non-weight-relieved mahogany body. Features include an updated antique finish, classic hardware, hide-glued neck, new truss rod and tuner designs, and vintage-style trapezoid fretboard inlays. 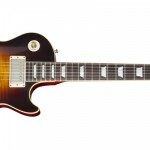 While all 1958-’60 Les Pauls are among the most saught-after electric guitars ever made, the ’59 Burst is often considered among aficonados to be the crème de la crème of the range. 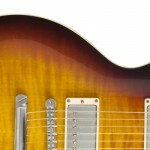 They are also exceedingly rare, with only 635 guitars shipped that year. With sales of the Les Paul declining every year since 1953, the year after its release, Gibson decided in 1958 to update the look of the model with an elegant Cherry Sunburst finish. Guitars from that first year of the Burst’s production often had relatively plain maple tops, but through the course of 1959, Gibson’s craftsmen built Les Pauls with tops that displayed more and more highly-figured grains, making these among the most collectible of the breed today. The 1959 Les Paul Standard Reissue from Gibson Custom accurately recreates the original hallowed ’59 Burst in every detail, and presents it in your choice of VOS finishes: Bourbon Burst, Faded Tobacco Burst, Iced Tea Burst, Lemon Burst, Sunrise Tea Burst and Washed Cherry Sunburst. 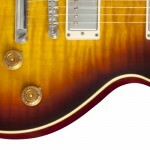 Gloss: Bourbon Burst, Faded Tobacco Burst, Iced Tea Burst, Lemon Burst, Sunrise Tea Burst and Washed Cherry Sunburst.While the 1959 Les Paul Standard retained the classic ingredients of the breed—its solid mahogany body and carved maple top, both represented here in the 1959 Les Paul Standard Reissue—the guitar also evolved slightly from its specs of the previous year. Les Pauls made in 1959 also acquired a slightly thinner, though still comfortably rounded, neck profile, which many players consider the sweetest feeling neck shape of all time, along with a smaller neck heel. These are all represented with utmost accuracy in the 1959 Les Paul Standard Reissue, while the guitar also benefits from Gibson Custom’s 20th Anniversary Specifications, newly adopted for 2013. 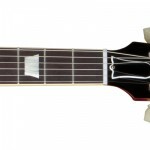 These include a one-piece rosewood fingerboard, Kluson™ Deluxe machine heads, hot-hide glue neck fit, a Historic Truss Rod assembly with no tubing, accurate body and fingerboard binding color, new Custom Buckers created in the image of the original PAFs, and period-correct Aniline dye offered in VOS and Gloss.Gibson Custom’s new Custom Bucker accurately recreates the original PAFs of the late ’50s, using Alnico III magnets and unequal turns of 42 AWG wire in each coil for that characteristic PAF “bite.” These pickups clean up beautifully at the guitar’s volume controls, while Bumble Bee tone caps assist in that warm, singing “woman tone” when you roll back the tone controls. To top it all off, the 1959 Les Paul Standard Reissue plays superbly right out of its Custom Shop hardshell case thanks to a trip through one of Gibson’s state-of-the-art Plek machines before it leaves the Custom Shop floor.Every guitar includes a Certificate of Authenticity, an owner’s manual and adjustment literature, and coverage by Gibson Custom’s Limited Lifetime Warranty and 24/7/365 Customer Service.